"I hope this time people will talk more about the music than the band itself." The last time Manic Street Preachers were in the news was late last year when, at their Kilburn National show, guitarist Nicky Wire made it known he hoped REM's Michael Stipe went the same way as Freddie Mercury. Before that, the Manics were almost sued after an incident at the Reading Festival, at which Nicky threw a battered guitar into the audience and straight into the head of a security man. And before that, the Manics hit the headlines when bassist Richey, in a frustrated moment, carved '4 REAL' into his forearm as sine misguided act of intent. Oh and somewhere in between, they made a bit of music. Manic Street Preachers are famous. Very. Or is that infamous? From Blackwood, in South Wales ('a depressed, dying industrial town', in Richey's words), they came and, yes, they conquered. Splendidly. Four big girls' blouses with too much eyeliner, they crashed into London proclaiming Motown Junk and You Love Us while the rest of country was still dancing to Madchester. Briefly, the spirit of punk was re-born, and while their audience would gob, reverently, on them from down in the heaving moshpit, the Manics said they would one day rule the world. No question. 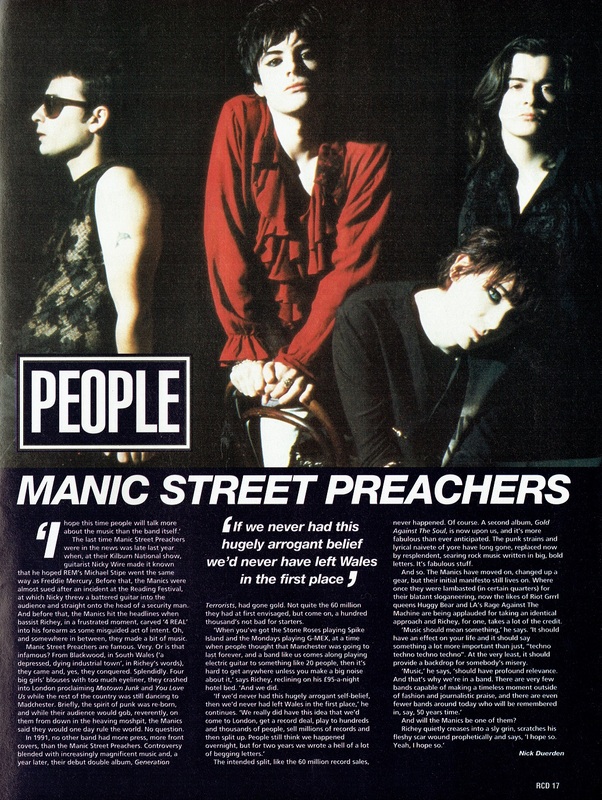 In 1991, no other band had more press, more front covers, than the Manic Street Preachers. Controversy blended with increasingly magnificent music and, a year later, their debut album, Generation Terrorists, had gone gold. Not quite the 60 million they had at first envisaged, but come on, a hundred thousand's not bad for starters. "When you've got the Stone Roses playing Spike Island and the Mondays playing G-MEX, at a time when people thought that Manchester was going to last forever, and a band like us comes along playing electric guitar to something like 20 people, then it's hard to get anywhere unless you make a big noise about it," says Richey, reclining on his £95-a-night hotel bed. "And we did." "If we'd never had this hugely arrogant self-belief, then we'd never had left Wales in the first place." he continues. "We really did have this idea that we'd come to London, get a record deal, play to hundreds and thousands of people, sell millions of records and then split up. People still think we happened overnight, but for two years we wrote a hell of a lot of begging letters. The intended split, like the 60 million record sales, never happened. Of course. A second album, Gold Against The Soul, is now upon us, and it's more fabulous than ever anticipated. The punk strains and lyrical naiveté of yore have long gone, replaced now by resplendent, searing rock music written in big, bold letters. It's fabulous stuff. And so, The Manics have moved on, changed up a gear, but their initial manifesto still lives on. Where once they were lambasted (in certain quarters) for their blatant sloganeering, now the likes of Riot Grrrl queen, Huggy Bear and LA's Rage Against The Machine are being applauded for taking an identical approach and Richey, for one, takes a lot of credit. "Music should mean something," he says. "It should have an effect on your life and it should say something a lot more important than just 'techno techno techno techno'". At the very least, it should provide a backdrop for somebody's misery. "Music," he says, "should have profound relevance. And that's why we're in a band. There are very few bands capable of making a timeless moment outside of fashion and journalistic praise, and there are even fewer bands around today who will be remembered in, say, 50 years times." And will the Manics be one of them? Richey quietly creases into a sly grin, scratches his fleshy scar wound prophetically and says, "I hope so. Yeah, I hope so." This page was last modified on 28 March 2018, at 04:45.